There are a number of clues you can use to successfully date antique and vintage brooches and pins. This usually begins with looking at things like clasps and hinges, since certain types are known to have been used during specific periods in time. The best jewelry detectives know that leftover components from earlier periods were sometimes used by frugal jewelry manufacturers, however, and clasps might have been replaced over time as well. In addition to examining the components and findings, you'll want to look at the overall style, examine for signs of repair, and use a jeweler's loupe to locate any identifying marks present as you're dating jewelry. 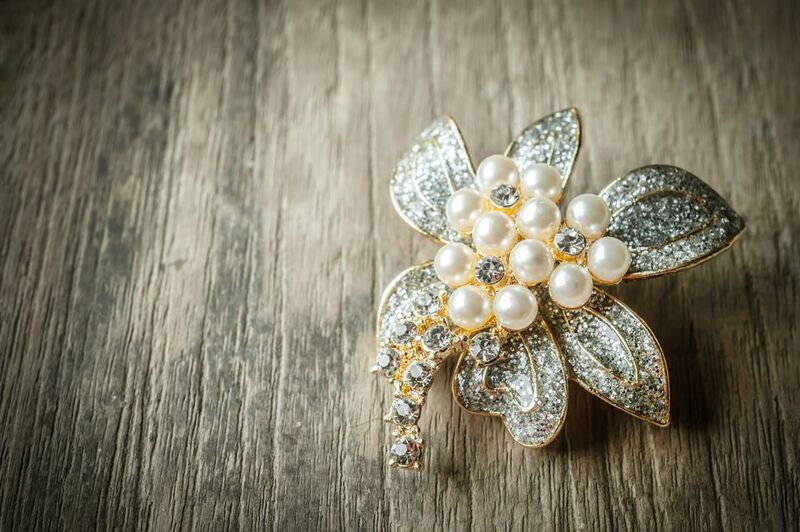 Use the basics below to help you start learning how to identify and date a number of different types of antique and vintage brooch and pin styles. This is a type of pin used to secure a sash at a lady's hip during the late 1800s when the fad of wearing a sash over the shoulder and across bosom (imitating Queen Victoria) or around the waist became popular. Most examples have very thick pin stems to allow for penetrating several layers of fabric. Many, but not all, resemble buckles from the front (like the example show here). These are usually rather large brooches and they fasten with a simple "C" closure (see below) without a safety mechanism. Common examples are made of brass, enameled or painted base metal, or silver-plated base metal. They range from simple rectangles or ovals to very ornate in design with flowing Art Nouveau motifs. Photo by Jay B. Siegel for "Warman's Costume Jewelry"
This type of simple "C" clasp or catch can be found on brooches dating primarily to the 1890s although some carryover designs in the early 1900s incorporate this finding as well. It was used on everything ranging from small Victorian bar pins to large sash pins (see above). The most common early version of the "C" clasp used prior to the 1890s looks more like a curled wire. Pieces incorporating the earlier style also have a tube-shaped hinge for the pin stem, and sometimes the point of the pin stem will extend beyond the edge of the brooch. Some pieces of inexpensive jewelry made during in the 1930s and through the decades since then have used a variation of the "C" clasp that is more square looking than rounded. Be sure to look at the overall style and materials when dating pieces using "C" catches. A collar pin is a metal fastener that connects the two sides of a shirt collar by passing underneath the tie. It can take the form of a large safety pin, or be shaped as a bar, either with clasps on either end or two spheres or cubes on either end, that unscrew and pass through holes in the collar (similar to a bar cufflink). This is a type of pin fastener was most popular during the 1930s. It was worn similarly to a brooch, but with a clip mechanism instead of a pin stem to attach it to clothing. The underside of the clip usually contains prongs to hold it securely in place. Dress clips were made of popular materials of the day including Bakelite (like the example shown here) and pot metal. Larger versions were sold singly. Smaller examples were often sold in pairs or sometimes as part of a "duette" (see below). The more petite clip duos were worn in various ways including at the bottom corners of square necklines. They can sometimes be confused with shoe clips. The first branded Duettes were designed and manufactured by Coro in 1931 in Art Deco styles. These clever mechanisms held two small dress clips (see above) in place to make a brooch, or could be removed to wear clipped on to a garment either singly or in pairs. Coro also made Duettes with small double-pronged clips (see pin clips below), especially during the 1940s, but there was some carryover into the 1950s as with the Coro angel birthstone pieces like the one shown here. Collectors have adopted the generic name "duette" when referencing this type of convertible jewelry. Other companies made versions of this style of clip/brooch mechanism, like Trifari's Clip-Mates first made in the mid-1930s, and they can also be found unmarked. Fur clip is the collectors nickname for what manufacturers referred to as a pin clip when they were newly made. It is a double pronged mechanism that was widely used in the late 1930s through the 1940s, although there was some lingering use in the 1950s. This type of brooch, usually long and vertically shaped, consists of a single central pin with two decorative ornaments at either end. The lower ornament, which either clicks or screws into place, is detachable allowing the connecting pin to be slipped through the garment. When fastened, the pin is invisible, so the two ornaments seem to float on the fabric. These pins were originally used to decorate, or fasten, a dangling ruffle known as a jabot worn by men on the front of shirts and women on the front of dresses dating to the 17th century. But as an article of jewelry, it came into its own around the turn of the 20th century, and flourished through the 1930s as a prime piece of Art Deco ornamentation. 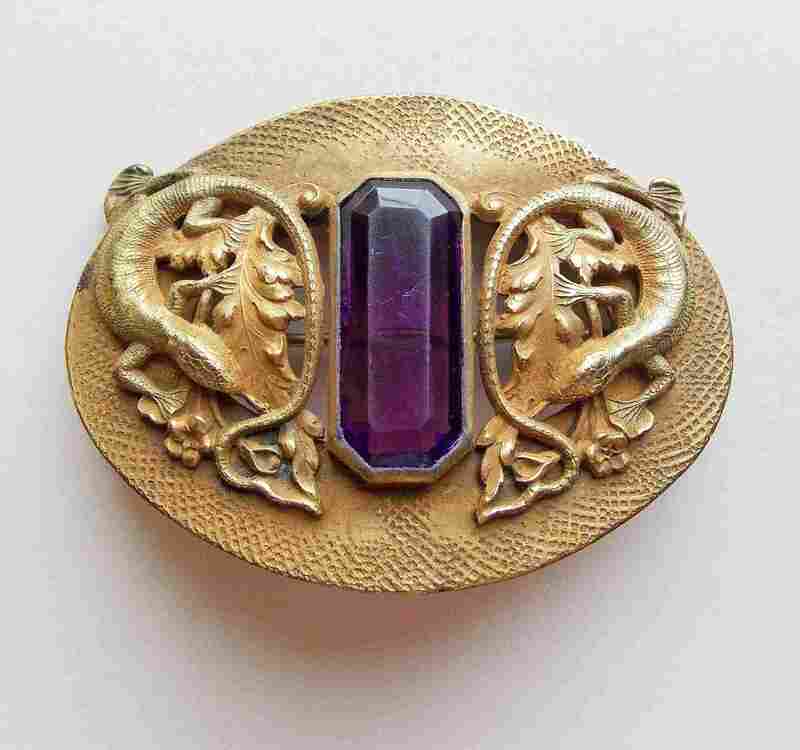 This pin style was worn on cloche hats, lapels, shoulders, and even handbags. They can be found made of precious metals and gemstones as well as costume jewelry examples. In the 1920s and 1930s, Cartier was famed for its jeweled jabots, which it called cliquet pins or brooches (named for the "click" made when the detachable ornament is snapped on to the pin). Safety clasp on costume jewelry brooch. - Photo by Jay B. Siegel for "Warman's Costume Jewelry"
The clasp or catch shown here is from a 1930s pot metal brooch. Earlier variations had a lever that closed the clasp, while this style has a rollover closure. This is one of the most common types of clasps used on costume jewelry from the late 1920s onward, and it is still in use today. Many times it is referenced as a "modern" safety clasp. Because this finding has been in use for such a long period of time, it is paramount to look at the overall design elements and components used when dating jewelry using this type of clasp. Trombone clasp on French costume jewelry brooch. Photo by Jay B. Siegel for "Warman's Costume Jewelry"
Trombone clasps, also sometimes referenced as push-pull safety clasps, were used on European jewelry beginning in the 1890s. Most are seen on French pieces or jewelry made elsewhere, like in Czechoslovakia, and imported into France. They were widely used on pieces made through the 1940s, and more sporadically after that time. Even some brooches made in the 1960s, '70s, and '80s, including a number by Chanel, used this type of clasp. The name references the way the round end pulls out, like a trombone musical instrument, to release the pin stem.